Metal Spraying On Site at Tesla Birmingham. Vanda Coatings were asked to undertake metal spraying on site at Tesla Birmingham which included all the metal cladding and curtain walling. Tesla Motors manufactures luxurious electric cars and is based in the USA with seven car showrooms in the UK and many more throughout the world. The whole building in Birmingham was being refurbished before it was due to open as a Tesla dealership, so our team were not working in a live environment. This meant there were many other trades on site including decorators, electricians, plasterers, plumbers, labourers and cleaners. Our Vanda sprayers are adept at working alongside others and often complete projects out of hours, so businesses can carry on opening as usual. In this case, as the showroom was not open all the on site metal spraying at Tesla could take place during the day. This dealership in Birmingham had previously been a Land Rover garage, but had been empty for some time. Consequently, it had been boarded up before it was taken over by the Tesla luxury brand. 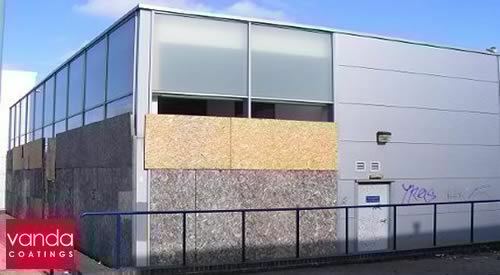 Once the boards had been taken down our team found there were a great number of holes where the screws had fastened the wood onto the silvery-grey metal cladding. All these screw holes had to be filled and then sanded down. This was not the only thing that had to be done before the actual spraying could start. As can be seen from the before photos below left, vast expanses of the cladding were covered in graffiti which obviously had to be removed or painted over. 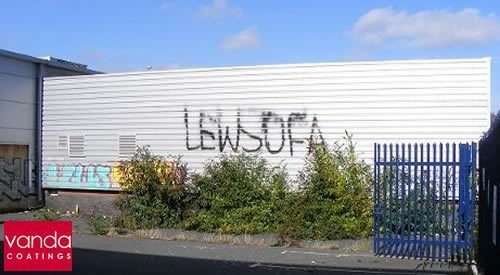 Before our operatives started metal spraying on site, another company jet washed the exterior in an attempt to remove all evidence of vandalism, but this didn’t work, so our Vanda team used a mechanical sander which did get most of the graffiti off. They then had to put barcoat on top of any remaining traces of graffiti after masking up. If a sealer had been put directly over the graffiti it would still have been visible so the barcoat stopped it bleeding through. Bond coat was then applied over the barcoat on the whole expanse of the cladding before three or four layers of top coat were spray applied. 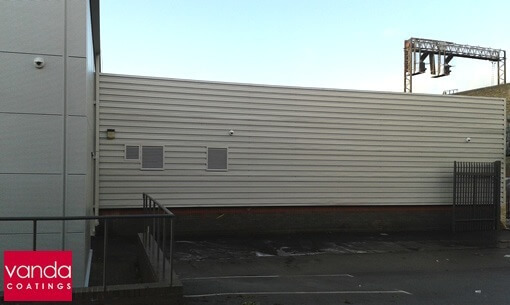 All in all the cladding as well as at least fifty aluminium windows were recoated. 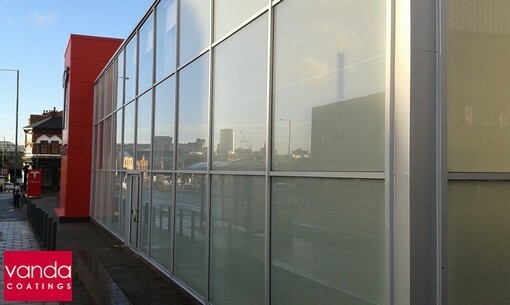 Every metal frame on the curtain walling was sanded down and after the glass and other surfaces were masked off, three or four layers of topcoat were spray applied by our Vanda operatives. The paint that was selected for the Tesla car showroom was metallic, which makes electrostatic spraying difficult. An airless system would have been too messy especially as it was very windy at the time, consequently the metalwork was re-sprayed using an HVLP (High Volume Low Pressure) gun. This resulted in a sleek finish as can be seen from the ‘after’ photos top and bottom right. A cherry picker was used for a large amount of both the preparatory work and the metal spraying on site at Tesla in Birmingham as the exterior was about six metres high. There was also some work to be done on the roof for which all our team members are trained for. Every sprayer with Vanda Coatings has PASMA and IPAF certificates as well as other health and safety qualifications. The last thing to do was to de-mask and clear up which included jet washing the car park. We pride ourselves in being tidy.